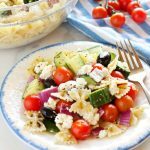 This Quick and Easy Greek Pasta Salad is the perfect easy summer side dish recipe made from healthy ingredients, and bursting with authentic Greek flavors! Recipe from thebusybaker.ca! Add the cooked pasta, cucumber, cherry tomatoes, green pepper, red onion, oregano, basil, olive oil, vinegar, and salt and pepper to a large bowl and toss everything together well. Top with olives and feta cheese and serve! Prepare this pasta salad one day in advance if you wish, and add the olives and feta cheese right before serving.